Jessup Correctional Institution was formerly known as Maryland House of Correction-Annex. 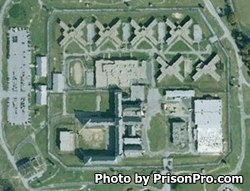 It is a medium security prison that can house over 1,725 adult males. The average duration of an inmate's sentence at this facility is 9.5 years. This facility has the distinct notoriety of being the facility which produces all of the license plates in Maryland. In addition, Jessup Correctional Institution is responsible for running a sewing shop that manufactures all of the inmate uniforms and pants for police officers throughout the state. Offenders housed at Jessup Correctional Institution can earn a GED while incarcerated and even take some college classes. Substance abuse treatment is also available for inmates. This prison also acts as an intake unit for inmates from six counties, and a transportation hub for offenders who have court and medical appointments. Visiting is everyday except Tuesday from 1pm-8pm. The visiting day is based on the last digit of the inmate's ID number and corresponds to the date they can have visits. Inmates who have an odd last digit are allowed to visit on odd days, and even last digit inmates are allowed visits on even days. Inmates are allowed two visits each week, and are permitted up to five visitors three of which can be adults.